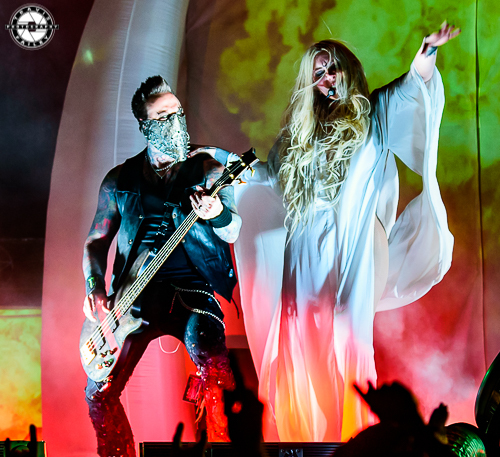 KNAC.COM - Reviews - IN THIS MOMENT In St. Petersburg, FL With Photos! 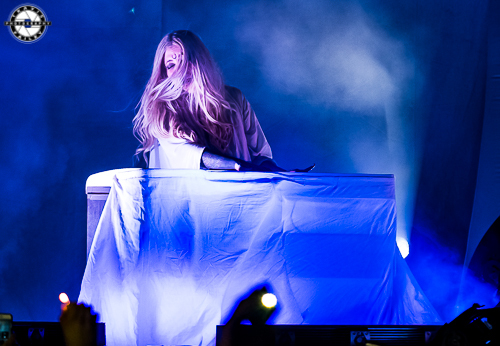 IN THIS MOMENT In St. Petersburg, FL With Photos! 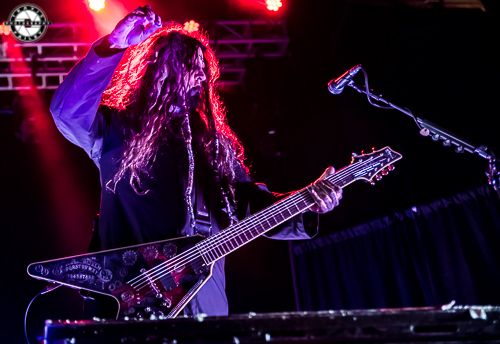 It was a chilly Friday night, a cool 54 degrees, when DED took the stage to kick off the “Witching Hour Tour” at Jannus Live. Jannus Live is a great outdoor venue and looking around, the place hasn’t changed much over the last twenty-something years. The outer walls (apartment buildings) provided a break from the wind, so the temperatures were bearable for us spoiled Floridians. I couldn't help but notice that the venue was busy early. The crowd consisted of fans of all ages, and there was an unusually high number of women for a rock show, even a few little girls in attendance. DED started promptly at 7 p.m. DED is a fairly new nu-metal band formed in Tempe, Arizona. They released their first album Mis•an•thrope in July 2017, and their first track “FMFY” in December 2016 by way of a music video. They have been in regular rotation on SiriusXM Octane and received great reviews on the festival circuit last year. I was looking forward to seeing them for the first time. Throughout the set I was impressed with DED's vocalist, Joe Cotela. He has an unbelievable range. Joe reminds me a little of Jonathan Davis (KORN) with his powerful vocals, and growly rap. Other guys in the band are guitarist David Ludlow, bassist Kyle Koelsch, and drummer, Matthew Reinhard with Kyle and David helping with intense back-up vocals. All three of these guys had a great stage presence. Due to limited space of stage, Matthew Reinhard actually played his kit behind a curtain (just like OZ). For half the show I thought that they piped in the drums. DED brought it. They don't need any bells and whistles; their music does the talking. Joe called for a mosh pit, and got it. Their music had the crowd jumping and shockingly, crowd-surfing. It’s been a rarity of late at Jannus Live and their security did a great job. 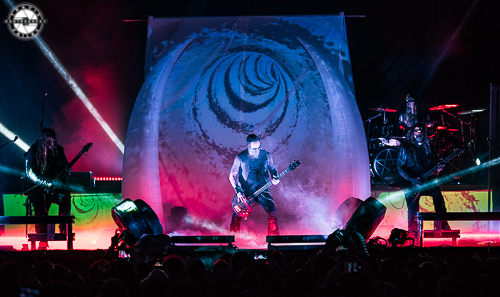 DED played "FYFM", “Remember The Enemy”, and closed with “Anti-Everything”, which is their biggest song to date and received the biggest pop from the crowd. Afterwards the guys hung out at the merch tent with their fans. DED are on the rise and should have a bright future. When Octane gets behind a band, they can make things happen (i.e., NOTHING MORE) By going out with ITM and P.O.D., they are exposing themselves to a variety of potential new fans. P.O.D., which is short for PAYABLE ON DEATH was the next up. These guys from San Diego have been making music and traveling around the world for 25 years and just got back from touring in South America. It's hard to believe that this was my first time seeing this band The last time that they were here (Clearwater w/ AVATAR and 10 YEARS) I actually left the show due to bitter cold (yes, I've been living in FL too long). Apparently DISTURBED brings the sickness and P.O.D. brings the coldness. P.O.D. was a perfect follow up to DED, with their high energy, rock/rap. During “Alive” Sonny Sandoval’s vocals pierced through crowd in a way that I haven’t heard before at Jannus. A lot of times at this venue, the vocals go directly up and out into the night sky. Sandoval’s energy and intensity was impressive and his constant bouncing across the front of the stage had zero effect on his vocal performance. Touring keyboard player Sameer Bhattacharya provided backing vocals tucked away on the side of the stage with Traa (bass) and original members Marcos (guitar) and Wuv (drums) providing an intense backing groove. P.O.D. opened the show with "Boom", and continued with hits that provided their fans plenty of opportunity to sing along during the chorus’ during the aforementioned "Alive" and then "Southtown". Of course a P.O.D. set wouldn’t be complete without them playing "Youth Of A Nation". 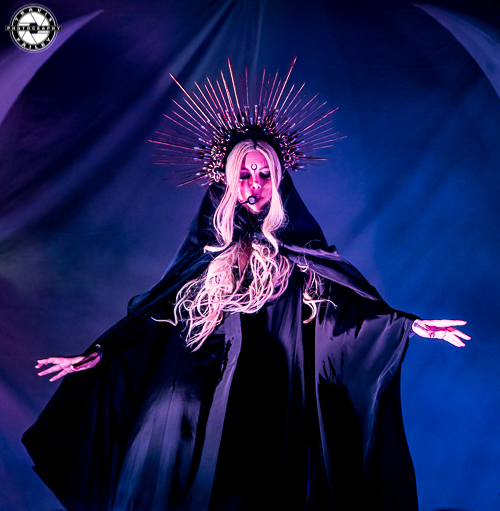 IN THIS MOMENT is out on tour promoting their latest album, Ritual, which was released last July. 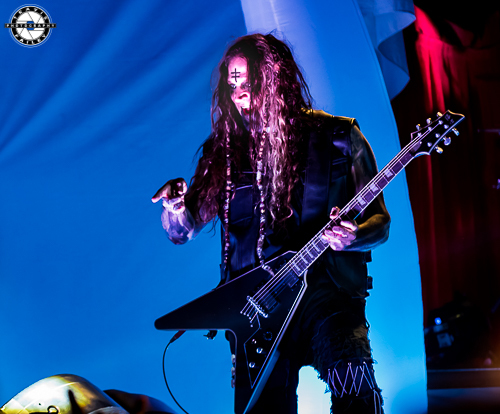 The band just completed the Half God Half Devil tour with MOTIONLESS IN WHITE, AVATAR and GEMINI SYNDROME. 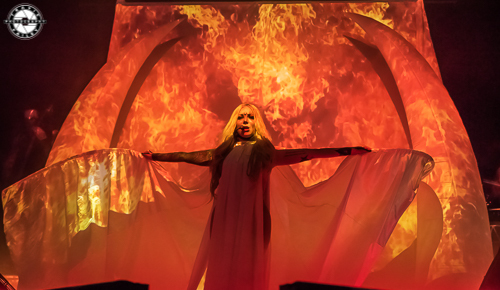 Because I’m an IN THIS MOMENT veteran, I knew that Maria would bring a brand new show, and she did not disappoint. 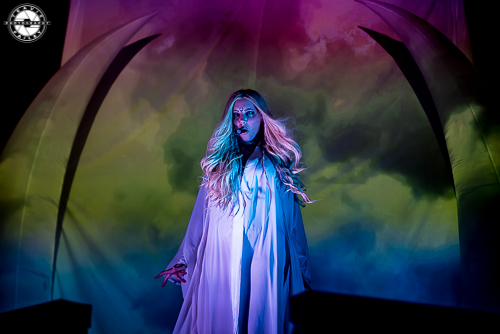 After a twenty-five minute set change, (and a 5 degree temperature drop) the curtain was finally pulled down and the always enchanting Maria Brink appeared in a flowing black gown and flesh-colored body suit, Freddy Krueger-style, donning a spiked crown over her long blonde hair. The Blood Girls (faceless dancers) were at Maria’s side and all three women moved in perfect unison as the band opened with “Salvation”. Maria sounded great. Her range was showcased when she brought it down behind a beautiful white piano with “Lay Your Gun Down”. Even though I have seen IN THIS MOMENT several times, I had never heard Maria sing in that style before. This show definitely showed a softer, more subdued side of her. We looked at our photo gallery from their last tour, and the show could not have been more different. Maria also took the time to thank the crowd for coming out to share the evening with them. You can really tell that she truly loves her fans and is grateful for them. After introducing the band, Maria left the stage and a “Monster Jam” ensued. Chris Howorth (guitar) Travis Johnson (bass) Randy Weitzel (guitar) and Kent Diimmel performed a medley of mashups. A couple examples were when they mixed IRON MAIDEN with MICHAEL JACKSON and specifically “Staying Alive” by THE BEE GEES was combined with AC/DC’s “Back In Black”. They may seem like odd choices, but they worked together and went over well with the crowd. The bewitching Maria then reappeared in a flowing white gown, holding a bouquet of dead flowers as she walked down the aisle at her Black Wedding, to “Here Comes The Bride”. 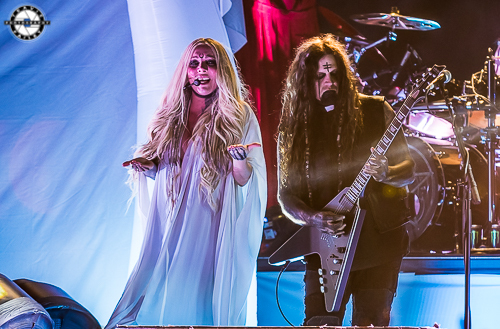 IN THIS MOMENT went on to deliver a theatrical performance of their latest release, “Roots”, "Oh Lord", killed a cover of Phil Collins' “In The Air Tonight" and closed the show with "Whore". The Witching Hour Tour is a definite debut of a gentler more emotional side of Maria. This provided more of an intimate feel than in previous tours but with the same effectiveness. If this tour comes by your town, don't miss it. DED is an exciting up-and-coming band, P.O.D. are seasoned hit laden veterans and IN THIS MOMENT are providing more substance than shock.